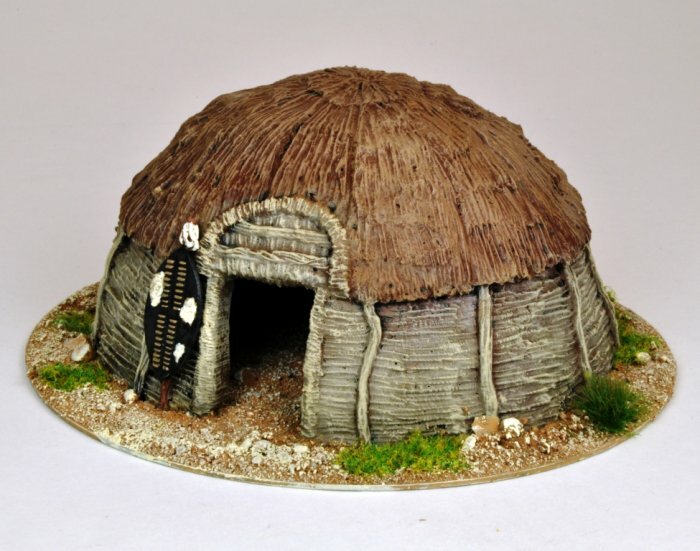 A beehive hut, the characteristic Zulu dwelling. The Matabele were a split off from the Zulu, and took the Zulu 'style' north with them. This included the language, fashion, fighting style and architecture. All of these combined to intimidate other people living around Matabeleland, using the reputation of the Zulus to inspire fear. It is noted that after the fall of Matabeleland in 1896, the Matabele changed to building huts in the style of their neighbours, the Shona. Resin one piece model, supplied unpainted. Painted example here has been put on a base and shield added for effect.